LIPSTICK is a basic product that all ladies have in their make up pouch. More often than not', we choose lipsticks based on their shades and not the ingredients. We should know that our lip condition goes down the hill after the age of 40 compared to our eyes, forehead and cheek area. Therefore, if lips are not properly protected, they lose the plumpness and start to look old. This spring, T'estimo offers you not only a vast selection of lipstick colours but lipstick that has a soft, melting texture, the Clear Memory Rouge This new long-wearing lipstick with a new-found ingredient – Honey Melting Oil - a moisturizing ingredient that melts with the body temperature. It is designed to hold its clear colour as well as its lustrous shine, rich moisture, and translucent sparkle. This wonder-of-a-lipstick maintains the beauty of a translucent glow long after it is first applied. Keep you lips moisturised for hours and look spectacularly delicious as you do. T'estimo is brought to you by Kanebo International. 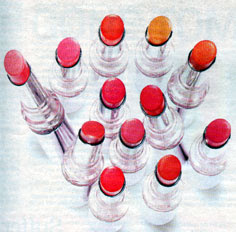 Pout: For lips that shine and look deliciously hydrated, try T'estim's Clear Memory Rouge lipsticks.